Stems: Erect, 1-3, stout, unbranched, glabrous, waxy. Leaves: Opposite, simple, stalked below, clasping above, spatulate to egg-shaped, 1 to 6 inches long, 1/4 to 2 inches wide, thick, firm, glabrous, waxy; margins entire; tips pointed or blunt. Inflorescences: Panicles, elongate, 5 to 16 inches long, with 3-9 whorl-like clusters of 2-3 flowers. Flowers: Calyces 5-lobed, lanceolate to lance-ovate, glabrous, waxy; corollas 1.5 to 2 inches long, bluish lavender to pink, conspicuously 2-lipped, upper lip 2-lobed, lower lip 3-lobed, glabrous inside and out; throat with pale magenta lines; stamens 5, 4 fertile, 1 sterile, tip incurved, bearded with golden-yellow hairs. Fruits: Capsules, egg-shaped, to 1 inch long, woody; seeds numerous, brown. 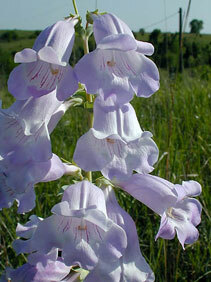 Habitat: Prairies, most abundant on sandy or loamy soils. Distribution: East-central 1/4 of Kansas. Uses: Native Americans used the roots in treatments of chest pains and stomachaches, and the leaves were used to treat fever and chills. Comments: Large beardtongue usually will not survive outside of its native habitat.